3 miles on the schedule today. Decide to do my 5 miler since it was so nice today. I've never tried toesock before so I thought it would be interesting to give them a test run. When I first got them, I just put them on to wear around the home to get used to the feeling. 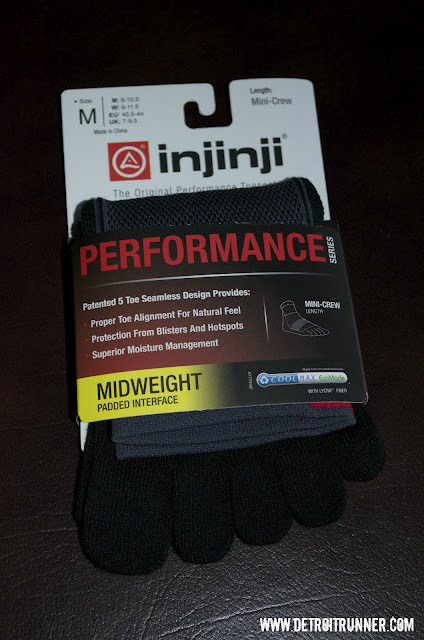 It does take a little getting used to having the material between your toes but they are very comfortable. To be honest, I was sure I was not going to like wearing these to run in. 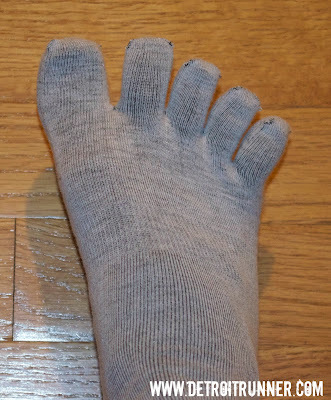 As I walked around the house, I thought, who wants to feel the socks between your toes? 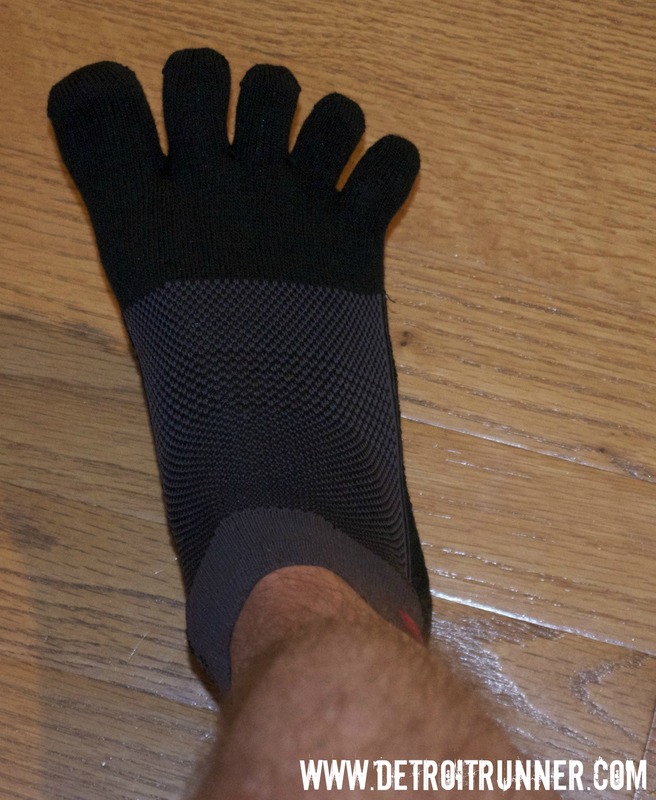 Of course, if you are used to running with Vibram's, you'd already be used to it. Well, everything changed when I went out for a run. 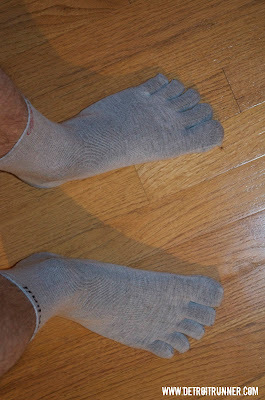 The really surprising thing about these socks is that you can't feel it. That's the great thing. They pretty much felt like other socks without the toes except that they help protect you from blisters. According to the company, they also give you "proper toe alignment for natural feel" They also seemed to keep my feet dryer. The other thing I was really surprised with these socks is the fit. 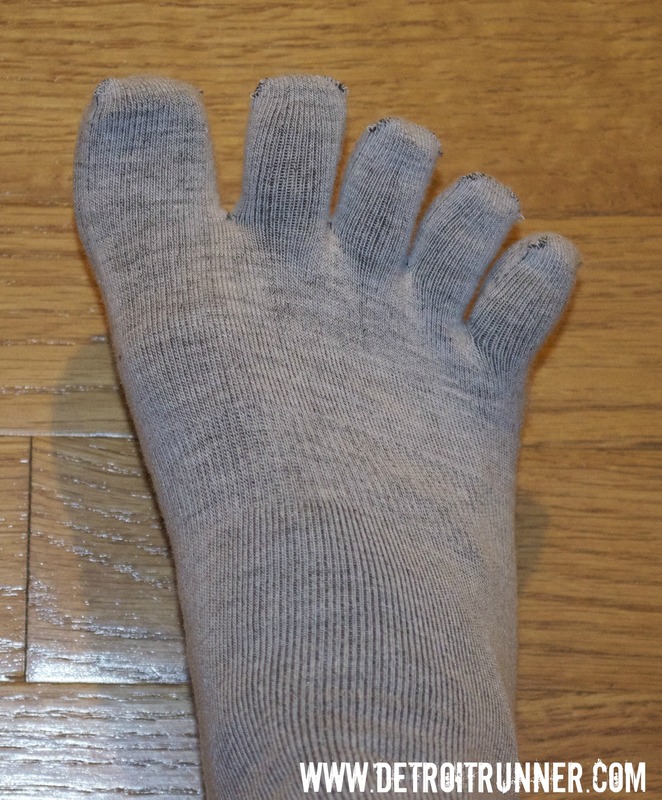 They fit similar to other socks by using your shoe size. What was unique is that they fit spot on. You know how sometimes socks are too big for you? For example, I was sent a Medium which is a shoe size 8-10.5 - you would think it would be big and sag at the heel since the fit needs to be good at the toes but it was perfectly fit throughout the foot. I was really amazed by how comfortable they were when you run with them. 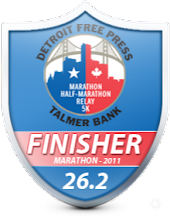 I've probably run at least 40 miles in them to get the feel for this review. There are a couple differences in the sock I was sent. First, the grey pair are lightweight and they are also crew length. They are also 75% CoolMax, 22% Nylon and 3% Lycra so you know they are comfortable on long runs. They kept my feel cool and because the toes are separate, I had less sweat on my feet at the end of a run. Personally, I do not like the crew length but they do come in three lengths so you can get what you prefer. I did, however, like the thinness of the sock. These are the thinest running socks I've ever owned and I liked that quality in them. Second, the black pair are midweight and they are mini-crew length. They are 50% CoolMax, 45% Nylon and 5% Lycra. Again, these were really comfortable to run in. They also kept my feel from sweating and while they were a heavier weight, I did not feel they were too hot. In fact, I could see using these on the trails especially since they are black. 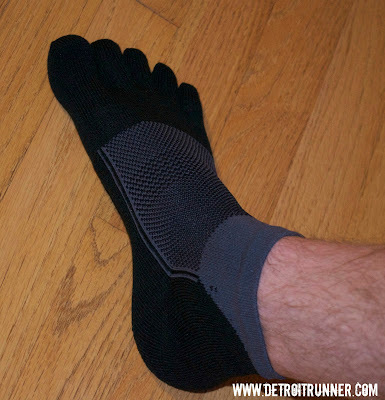 I also love the mini-crew length and the midweight is about the thickness of most other running socks. 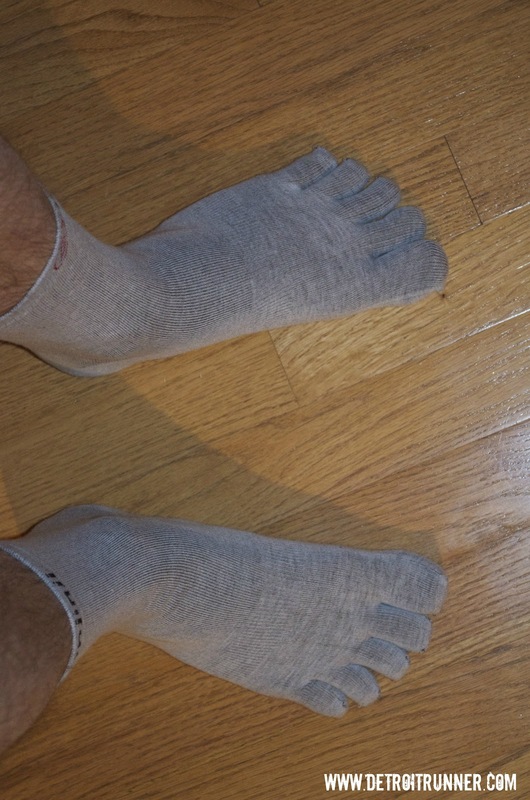 I would also add that the top of the sock was made with mesh so it helped keep your foot cool. Again, the socks fit perfectly. 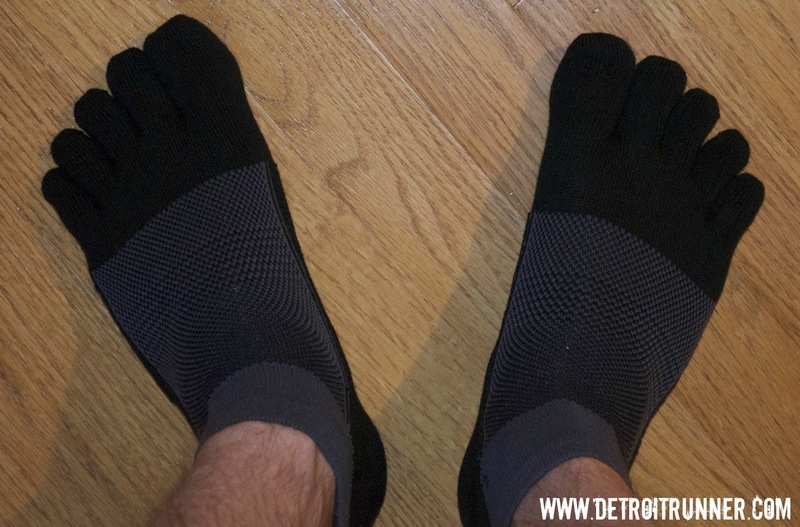 While I don't own a pair of Vibrams to see how they go with those shoes, I imagine that they would work quite well for people who don't want to be barefoot in the shoe and/or for wintertime as well. 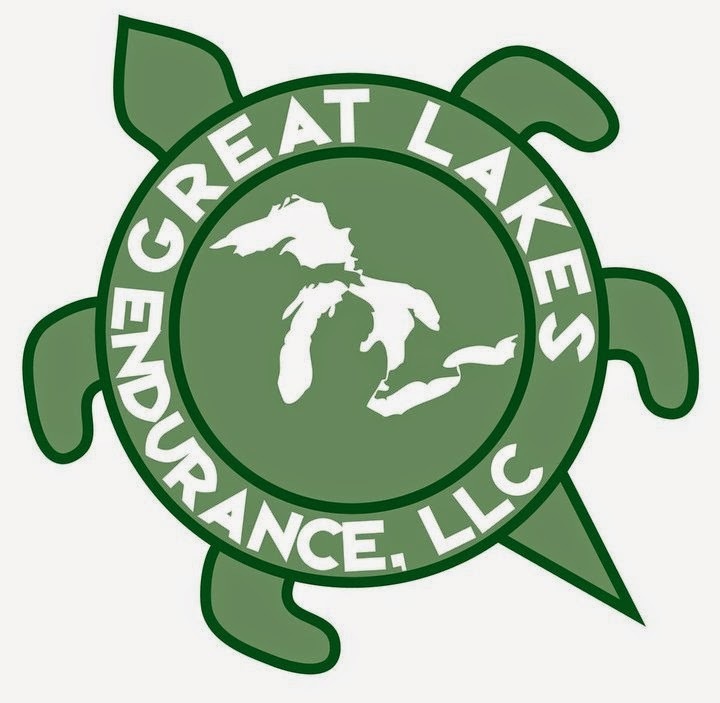 - They do take a little longer to put on since you have to get them on your toes properly. - Some may not like the feeling of material between their toes. 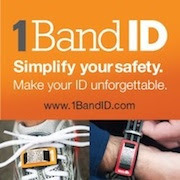 If you have every been interested in trying out these, I would suggest picking up a pair. They are not just for barefoot shoes. I think you will be surprised like I was and be happy with your purchase. 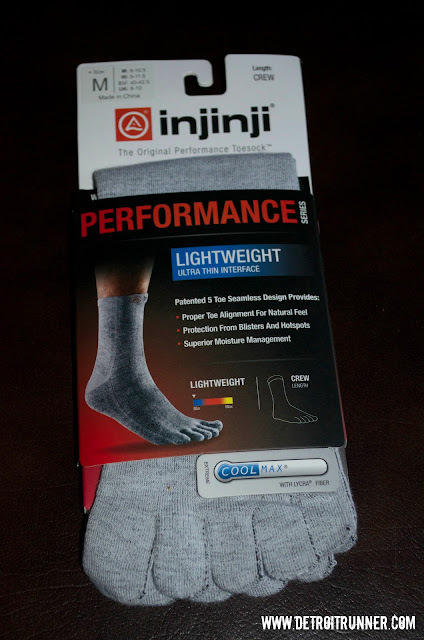 * Note: I received two free pair of Injinji socks in exchange for a review. I was not required to give a positive review and all opinions here are my own. Interesting indeed! I've looked at them often but as you I also think (thought) it can't be comfortable. Maybe I'll take a closer look. These socks are my FAVORITE. Glad you liked them too! I've been interested in trying these for awhile. Thanks for the great review! Very cool! I just bought a pair today. I have a friend who swears by these because she doesn't get blisters! I might try them since I am prone to get blisters in the same sweaty spot! I kind of like popping the huge blood blisters after a nice long run though.